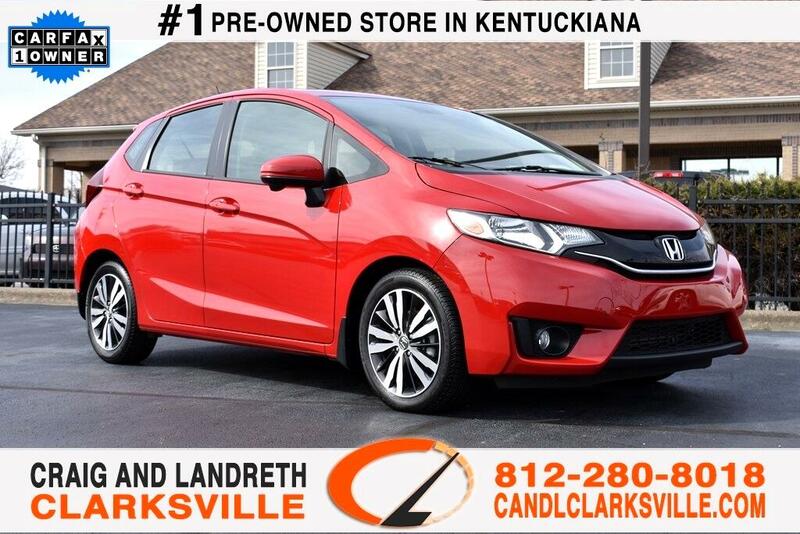 CERTIFIED BY CARFAX - ONE OWNER AND NO ACCIDENTS 2017 HONDA FIT EX HATCHBACK ** ONLY 11K MILES ** PROBABLY ONE OF THE BEST PREVIOUS OWNERS THAT YOU COULD HAVE........FACTORY NAVIGATION ** MOONROOF/SUNROOF ** 7-INCH TOUCHSCREEN DISPLAY ** HAS REMAINDER OF FACTORY WARRANTY ** REAR AND SIDE VIEW CAMERAS ** LANEWATCH ** BLUETOOTH ** PUSH BUTTON START ** KEYLESS ENTRY ** THIS IS A NON SMOKER & GARAGE KEPT VEHICLE SINCE SHE PURCHASED IT NEW AND IT LOOKS LIKE IT INSIDE AND OUT AND THIS IS A FACT!!!!!!! LOCAL TRADE AND LADY OWNED ** THIS CAR IS IN SHOWROOM CONDITION AND THAT IS WHERE YOU WILL FIND IT ** WHY BUY NEW WHEN YOU CAN'T TELL THE DIFFERENCE ** THIS FIT IS FLAWLESS, JUST LIKE BUYING A NEW ONE BUT YOU SAVE THOUSANDS ** TOO MANY OPTIONS TO LIST BUT WE HAVE A HONDA EXPERT ON-SITE IF YOU HAVE ANY QUESTIONS PLEASE CALL CALL RICHARD SPAN, JAKE SMITH, OR JIMMY SMITH JR AT 812-280-8018!! WE'VE NEVER LOST A DEAL WHEN IT CAME TO PRICE OR QUALITY!! THIS HONDA FIT HAS BEEN INSPECTED BY OUR SERVICE DEPARTMENT WHO COMPLETED A 110-POINT REVIEW TO ENSURE QUALITY. WE HAVE THE CLEANEST PRE-OWNED VEHICLES IN KENTUCKIANA! THIS FIT COMES WITH THE REMAINING FACTORY WARRANTY!!! Fresh oil change, White glove detailed, 110 point safety inspection, Bluetooth, Keyless Entry, Rear View Camera/ Backup Camera, Sunroof/Moonroof, Satellite Radio/ Sirius XM, Push Button Start, Keyless Ignition, 2nd Row Bench Seating, Parking Sensors, Parking Assist, Keyless Start, One Owner, Lady Driven, Non-Smoker, Local Trade, WHY BUY NEW WHEN YOU CANT TELL THE DIFFERENCE, THIS CAR IS LIKE BUYING A NEW CAR BUT THOUSANDS LESS, Lots Of Options, Bi Xenon Headlamp Package. 29/36 City/Highway MPG.....Odometer is 5410 miles below market average!!!! Message: Thought you might be interested in this 2017 Honda Fit.